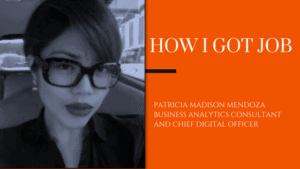 Patricia is a Business Analytics Consultant and Chief Digital Officer for a data analytics start-up in Manila, Philippines. Her passion lies in creating superior customer experiences through data. She has a curious mix of competencies in Marketing, Technology, Fashion, Digital, Communications and Business Analytics with hands-on experience in building consumer businesses and brands. A digital-savvy millennial executive with 11+ years experience in companies of various scale, industries and cultures – from the hustle and bustle of a marketing agency, to a pioneering game-changer, to an SME challenger business, to a corporate behemoth and industry leader and now bootstrapping in the technology start-up space in the Philippines whilst holding consultancy and advisory roles in companies undergoing digital transformation. I was a total nerd and a fiercely competitive one, of which I competed with myself and no one else. I juggled studies with varsity time (basketball). It was both tough and so much fun. Proof that FOCUS and FUN can go well together if you just know when and how to switch them on/off or do them both at the same time. I may not always have the answer to anything but I will make sure to get it. And it starts by asking the right questions and having the courage to ask ! And I just choose to work hard if I want something so bad. Another thing I tried to learn early in life was how to negotiate my way into the things I want and need to achieve my end-goal. And I guess that helped a lot when I got out of college up until now. I know and believe that there is always a way. I put in my best effort, then I let go to allow the universe to do its job while I have fun along the way ! Why did you seekout a career in Data Analytics and Technology? I’ve always known I’d end up doing something too early for its time. I always do. Yes I sought this out but I also stumbled upon it. When I look back, I’ve always wanted and been handed with jobs that am supposed to build from scratch, shape and ship, to introduce something new and to create new value. It’s very much like the feeling of having to move mountains. And most of the time, sheer audacity is the only way to get things done. Hence, that is also what I intend to do in the Data Analytics space in the Philippines. It is an uphill climb but I love the ambiguity, uncertainty and complexity of it all. it stimulates me and keeps me going. I am always interested and challenged when there are barriers to shatter, perceptions to change, hidden value to be created, an envelope to push. That nice girls do not get the corner office, and I do not mean that in the literal sense. One of my earliest role models was our Managing Director in the advertising media agency I have worked for. She was one hell of a woman. Imagine a 21 year old me keenly observing the ways of this powerful woman who’ve got the industry at the palm of her hands? It was a very good experience with so much to learn from. I have gotten flak as well for being too assertive and strong. But you get better with age and experience, that much is true. And I can say that moving out of the rat race or the corporate world presented tremendous benefits and improvements for me, both personally and professionally. And I have gained a broader, more mature and more open view of situations, relationships and life in general. I stalk ! Haha but yes that is true. I obsess myself with information not just about the company am applying for but the industry it belongs to as well. You need to be able to converse fluidly and intuitively with the interviewer. I also put myself in the shoes of my future boss or the owner of the company. I think of where I want to bring the brand or the company in the future and imagine concrete things I would do to make the vision happen. I also try to identify business problems I can solve and opportunities I can capitalize on. I enjoy that thought process, actually. So for me, the best candidates are those who have sound (not necessarily correct at the onset) frame of decision-making with a smattering of critical thinking, creativity, a healthy dose of fearlessness and humility. And you need to be multi-dimensional. You have got to be interesting ! When I look at my book shelf now, I actually feel good about the books I have collected for the past decade and a half. It’s well-curated. I’ve got a good mix of subject matters — from management to technology, from fashion to history, from biographies of tech icons, generals and presidents to women empowerment. Malcolm Gladwell, Garance Dore, Robert Greene, Diana Vreeland, Jack Welch, Betty Halbreich, Seth Godin, Sheryl Sandberg are just some of the names you’d see in my reading list. Hard to pinpoint a few books. Each book in my shelf has, in one way or another, shaped and influenced me. But what’s in my bedside table now are a stack of technology books and then some — 10 Types of Innovation by Larry Keeley, Sprint: How to Solve Big Problems and Test New Ideas in Just Five Days by Jake Knapp, Small Data by Martin Lindstrom, Thinking Fast and Slow by Daniel Kahneman, The 5 Essential People Skills by Dale Carnegie, Une Femme Francaise by Catherine Maladrino and the Mindfulness Manual: Your Guide to Finding Calm. Do not be afraid to go 2 or 3 pages if you have to. Just make sure you have a very compelling story to tell. No matter what level you are in, be data literate, upskill yourself with the latest technology tools, and think of how you can leverage technology and data to make a difference in the company you are applying for. If you have these, then that’s an immediate edge you have there. That is, provided you already have the necessary soft skills to lead and succeed. Nothing beats having the killer combination of good interpersonal and leadership skills, business acumen and technology-savviness in the modern workplace. And again, you have got to be interesting and unique ! Check out my blog article on the 4 Essential Tips in Choosing a Data Science and Analytics Course if you’re planning a career shift to this space or you simply want to upskill yourself to become more competitive in the job market. I guarantee that you will stand-out if you have this under your belt no matter what functional role you are in. I sign-up for websites and blogs and follow social media pages with content I am passionate about so that I get fed with relevant articles or posts in my inbox everytime there is something new. I go out and talk to people ! I follow interesting people on Facebook, LinkedIn and Instagram no matter what field they’re in whether in business, tech, media, fashion, academe, etc. Especially that am in the data analytics space, all the more I need to be multi-disciplinary and attuned with adjacent and out of left field occurrences and topics. I also try to listen and watch people with their own alternative take on things. Helps me become a better critical thinker and makes me question norms. So you can say I am a voracious consumer of digital content and it comes so naturally to me.